The Canon imagePROGRAF iPF770 MFP L36e, large format imaging system is an affordable scan-to-copy/file system for low-volume and entry-level users. 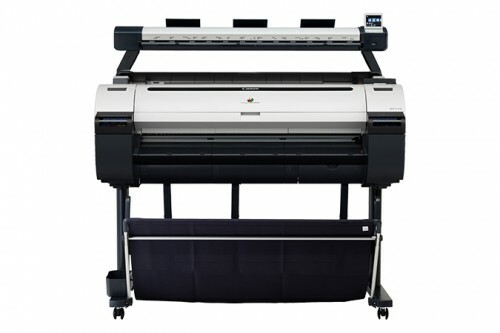 With a 36" wide scanner the iPF770 MFP L36e is ideal for low-volume subcontractors,primary education, design offices, architectural firms and reproduction businesses. The lightweight scanner and compact design allow for easy installation in even the smallest environments. The user-friendly control panel has picture icons for easy identification of the scanner operations. Simply scroll left or right to view the different icons, make your selection and press the Green Button! This system is for those who do not require the advanced functionality of the MFP M40 imaging system. The new Le Series complements the current MFP M40 product line by providing a product that offers basic scan-to-copy capabilities at an affordable price. Offering more than just the scan-to-copy functionality, this imaging system gives you the ability to scan to USB, scan to copy and archive, scan to multipage PDF and scan to your PC as well as reduce and enlarge images. With three different quality modes available, you can choose Draft, Standard or Best mode based on the scan/print you are creating. The iPF770 MFP L36e is an affordable solution for providing easy-to-use scan-to-copy/file capabilities for the entry-level user. Designed for simple operation, this MFP has intuititive hardware and software makiing the learing curve minimal for those new to large format scanning. The iPF770 system comes available with user-friendly software solutions ready to meet your printing needs. Direct Print & Share1, Canon's cloud portal solution and batch printing software, is available as a download and allows for files to be uploaded, downloaded, shared and printed from almost anywhere in the world! Also downloadable is a mobile printing app, imagePROGRAF Print Utility2, which allows for PDFs as well as JPEGs and PNGs to be printed through use of an Apple® iPad®2. The Accounting Manager software (PC only) allows you to track job costs, while the Print Plug-in for Microsoft® Office enables for documents created with Word®, Excel® or PowerPoint® to be easily printed in large format. Creating custom signage has never been easier with Canon's included PosterArtist Lite poster creation software, this easy-to-use software will have you creating professional large format prints quickly in just four easy to follow steps.